Living in Connecticut, we generally don't find too many morels. The soil is not right, the trees are not right, and historically, there just are not that many here. Last year it took six adults a few hours to find 27, this year those same six adults found only 12. On our forays with Connecticut Valley Mycological Society, most of the hunters return to the display table with a few specimens, rarely a dozen, and often the only morels in attendance were found off-site a few days before the foray, and brought out for observation and bragging rights. 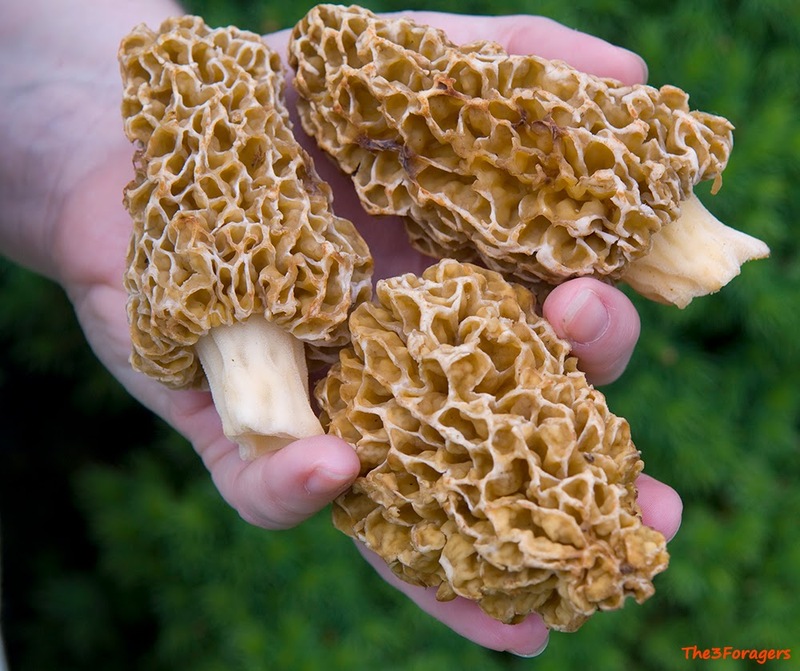 Last week I came home from work one afternoon to find Robert grinning like a fool, and he asked me to guess how many morels he found. Five? Ten? Nope, he found one hundred and forty nine. 149. 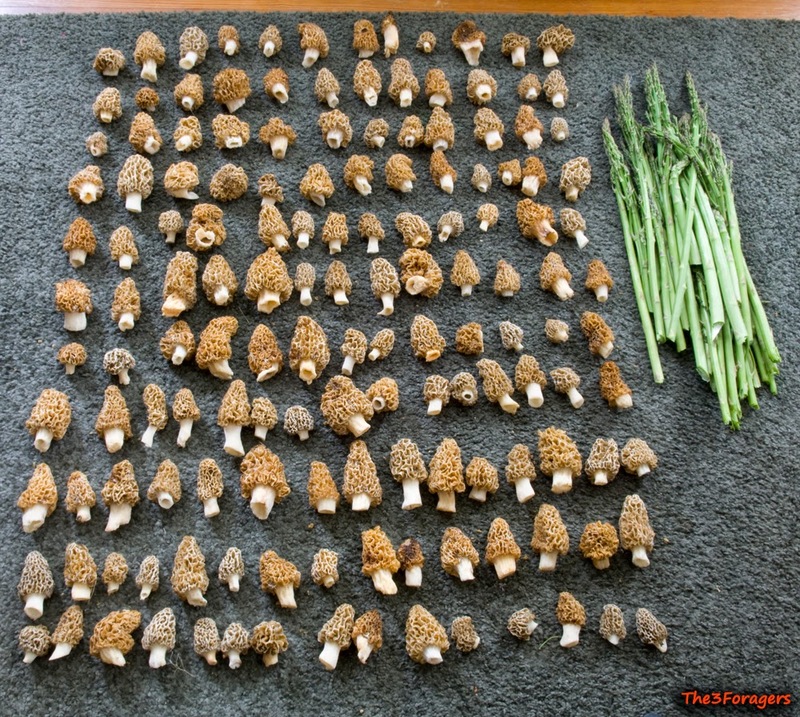 He was out picking feral asparagus in one of the few patches we frequent in the spring, and realized he was surrounded by beautiful Morchella americana, the blonde morels. Since we had never had so many to deal with before, we wondered how to cook them up or preserve the precious harvest. Most were dried, some were added to scrambled eggs, some went into an asparagus and cream sauce, and the ugliest ones were chopped up and made into biscuits with ramps leaves (Allium tricoccum). 1. Over medium heat, slowly sautee the chopped morels with 2 Tbsp of the butter for 10 minutes, until the morels are browned. Chill the butter/morel mix in the refrigerator until cold and re-solidified. 2. Heat the oven to 425° F.
3. In a large bowl, mix the flour, baking powder, baking soda, salt, and chopped ramps together. 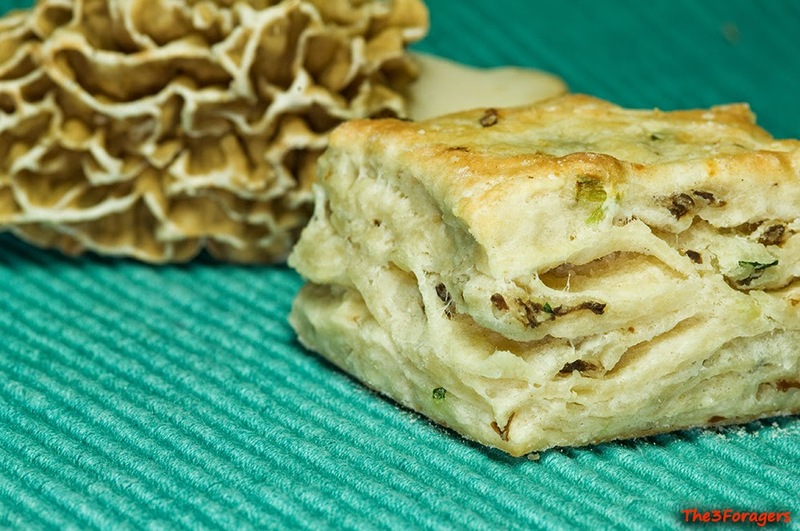 Slice the 4 Tbsp of cold butter thinly and add it to the flour, and crumble in the cold butter/morel blend. Mix it all gently, making sure there are still pea-sized bits of butter in the mix. 4. Pour in the buttermilk and gently mix together, just until it forms a crumbly ball. 5. On a generously floured surface, dump out the dough and press into a ball. To get lots of flaky layers, roll it into a rectangle, then fold it into thirds like a business letter, pressing it together. Make a quarter turn, and roll it back out into another rectangle. Fold it again into thirds like a letter, and roll it into a rectangle about 6" x 8". 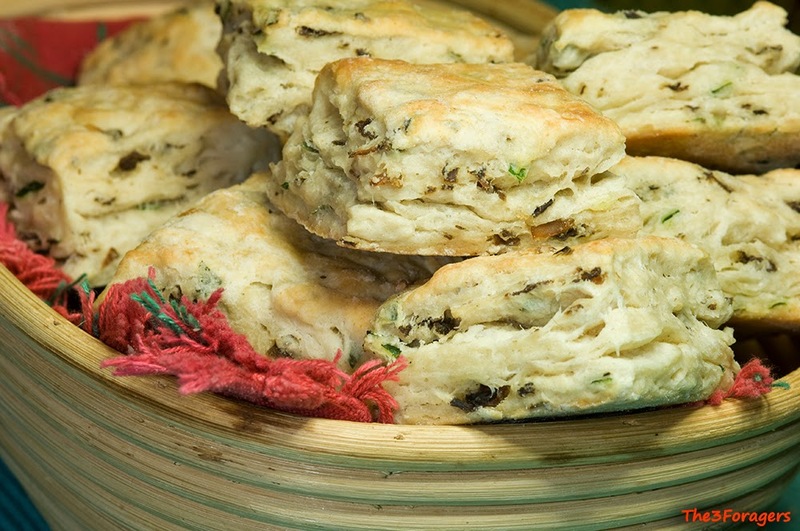 Using a knife or biscuit cutters, cut out 12 biscuits and place on a parchment paper lined cookie sheet. 6. Bake at 425° F for 14-17 minutes, until lightly browned on top. Serve warm, preferably with gravy. A new camping season with friends has started, beginning with our first outing of the year, this past Mother's Day weekend. Sure, I didn't get flowers and breakfast in bed, but I did eat morels around the campfire and woke up to birdsong in the woods. Dinners were fantastic again, with communal cooking for the meals, our cooperation made mealtime easy and abundant. We had vegetarian chili, venison stew, beans and rice, fried dryad's saddle, and fresh bread for dinners. Potato pancakes, ramps and wild rice hash, and toad-in-the hole, plus bacon and toast filled our tummies in the mornings. We fished for a couple small brook trout, and gathered fresh ramps greens in the woods. While our actual hunt only yielded 11 morels, 6 Morchella americana and 5 Morchella punctipes, we did find a good amount of tender Dryad's saddle (Polyporus squamosus) to slowly cook until browned and crispy. The season is late and chilly where we were camping, even the ferns were not yet unfurled and many trees were still leafless. Even with a thunderstorm and some night time rain, plus a flood in the screen house that needed to be drained, we still had a great time and look forward to the 2014 camping season with our fellow mushroom hunters and foragers.